There are sound reasons why the Eagles are a favourite punching bag for a certain type of music fan. But watching the first two hours of a three-hour (!) documentary film about them last night, I started imagining an alternate reality in which they’d put off making Desperado for a year and instead looked up their old hero Gram Parsons, backing him up they way they’d backed Linda Ronstadt. Of course, that version of the Eagles contained a former Burrito Brother in Bernie Leadon, the guy who put the most country into the Eagles’ early sound, which may or may not have made that series of happenings more likely. But it’s interesting to imagine what music Parsons might have made with a slick country-rock band. For he never really worked with such an outfit: the Burrito Brothers were anything but slick on their debut album, and dispensing with their roster of little-known session drummers for full-time Michael Clarke for Burrito Deluxe didn’t exactly help them to tighten up. The TCB band on GP and Grievous Angel, meanwhile, well they sure were slick and they sure were country, but rock was quite beyond them. Which was the point when Parsons hired them, but I’m afraid I’ve never found their work on those two Parsons records completely satisfying. I’m too seldom surprised by anything they do. In contrast, I’m constantly surprised by the Burritos. They throw every idea they have into their arrangements. They lurch through their songs, with spirit and feel prized more highly than precision. Mistakes are made and left in (my favourite is the little cough on Parsons’ (?) vocal in the left channel during the third chorus when he blows the high note (‘she’s telling dirty lies’) and the audible grin with which he sings the rest of the song. This may sound like corny indie fetishising of the lo-tech and amateurish, but I assure you it goes deeper than that (that’s not really my style nowadays anyhow – I’m a Steely Dan fan). For all that Parsons wanted to make pure country music in 1973, he was a more interesting musician to my mind when he was mixing country up with other forms of music. The R&B influences (present in the song choices, sure, but also in the performances) on Gilded Palace, the Dylanisms, the psychedelic pedal steel guitar (played through Leslie speakers and fuzzboxes) – you add it all up and you get that thing Parsons called ‘Cosmic American Music’. 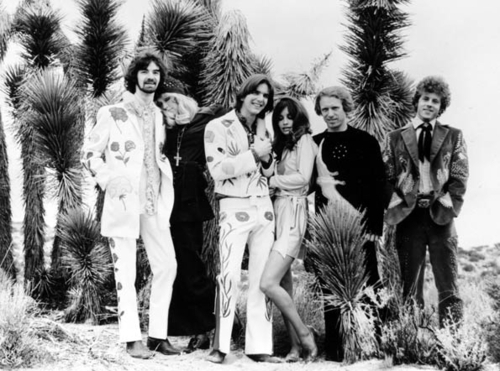 On GP and Grievous Angel you get country music, with slightly chintzy Vegas trimmings, and somehow the band just don’t sound as invested in the songs as they do on Emmylou Harris’s early records, on which their playing is superb: tasteful, but empathetic and soulful too. I guess I value Gilded Palace more because of it’s staggering/swaggering joie de vivre. It’s full of spirit and the excitement of experimentation, which makes his later work feel a little ossified by comparison. There’s great songs on those two solo records. No one with ears that work could deny Gram and Emmylou harmonising on Love Hurts, I totally understand why people get so excited by $1000 Wedding, and Streets of Baltimore is a great song, well sung. But if I was going to recommend one record to fully convey the Gram Parsons experience to someone who’d never heard him, I’d unhesitatingly point that person in the direction of The Gilded Palace of Sin by the Flying Burrito Brothers. This entry was posted in Music and tagged Burrito Deluxe, Cosmic American Music, country music, Emmylou Harris, Flying Burrito Brothers, Gilded Palace of Sin, GP, Gram Parsons, Grievous Angel, TCB Band on June 9, 2013 by rossjpalmer.